Very rare US Swan Pencil Co. lefty! 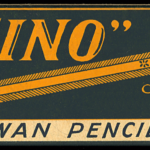 Many of the larger and well known European pencil companies opened up a franchise in the USA. For example, The House of Faber: A.W., Eberhard, & Johann. It appears that Schwan did the same, using the American spelling of Swan on its pencils manufactured in the U.S. as well as some made in Germany.